In the Old Testament stories we are at the springs of great histories. We move among individual men whose lives give character to the nations and all history. We cannot read these stories without being impressed with the likeness there is between those men and the men of today in all the great essential facts of their human nature. Manners have changed, customs have changed, motives have changed, methods of operation have changed, speech has changed; but sin and sorrow and temptation and love and hate and all such things are identical. And we may get lessons from these lives that will touch us at the very point where we are living today; and for that purpose I want you to look at the story of Lot. Lot has been associated with Abraham from the first move from Ur of the Chaldees. With Abraham he tarried at Haran, and went down into Egypt and returned from Egypt. They became very wealthy men, moving to and fro according to the nomadic life characteristic of the times. If you take the thirteenth chapter of Genesis and read it at your leisure, you will find it chronicles domestic difficulties. There was a quarrel between the herdsmen of Lot and the herdsmen of Abraham. These difficulties had in them the elements of per­manent discord. It was very evident this kind of quarrel would continue, and thus it is that Abraham, with the insight of a great statesman, and the mag­nanimity of a great soul, counseled separation, and allowed Lot, the younger man, the man dependent upon him, to all outward seeming, to be the one to choose the way in which he shall go. One word before we look at this choice. Crises never make character; crises reveal character. It is a great mistake to imagine that a crisis makes a man; it rather brings him out in his true colors. You can find out where men stand when they face a crisis. Another thought. The most searching crises that ever come in the lives of men are not great events, but little ones. Imagine these two men, of great stature morally in that age, being brought to a crisis that revealed both of them in the clearest and most vivid light, because there had been a quarrel amongst the men they employed! Many a man has been revealed in his true light by some little event that might arise at any moment. Lot has his chance, he thinks. He gets where he can look on the land, and then chooses, and says to Abraham: "There is what I have chosen." What did he choose? "Then Lot chose him all the plain of Jordan; and Lot journeyed east: and they separated themselves the one from the other. Abram dwelled in the land of Canaan, and Lot dwelled in the cities of the plain, and pitched his tent toward Sodom." He chose a well-watered plain in the valley of Jordan, because it was rich and fruitful, a plain that was like the land of Egypt. He had never got Egypt out of his heart since he went down there, and he chose as he did because in that plain were cities—I want you to see that particularly—centers of com­merce, places where men were making money very fast. Study the cities of the Bible, and you will find that they have always been centers of evil; and they always will be until the great city of God is built. God did not start man in a city, but in a garden. It is important for us to remember that. Lot looked at the cities, where men traded together and made wealth, and chose that. What is he seek­ing? His own personal advantage. That lies at the root of his choice. It was as though he had said, "I have found a new way. I believe in God, and believing in God I want to strike a happy medium between godliness and Egypt. I am not going back to Egypt, but that plain is like Egypt, and I will choose it. There are cities there, and I will get near them." Did you not notice what the verse said: "Lot pitched his tent toward Sodom?" Why not "within Sodom?" Because he knew the wickedness of Sodom; because he knew perfectly well that in those cities there were things that dishonored the God whom he loved, and whom he desired to serve; and he would not enter the city, but would get into its neigh­borhood. I believe if you could have read into the heart of Lot you would have found he was saying something like this: "Well, I will go near to these cities because they will be advantageous to me, and it will not do me any harm; and I may be able to do Sodom some good." So, not in, but toward, Sodom, Lot pitched his tent. Now let us see the sequel. 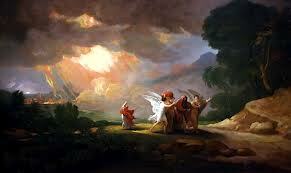 Turn to Genesis 14:12: "And they took Lot, Abram's brother's son, who dwelt in Sodom, and his goods, and departed." He has got in since we saw him last! Sometime has elapsed since that day he made his choice, and he is no longer in the neighborhood of Sodom, but right inside. "He pitched his tent toward"; "he dwelt in Sodom”;—that is advancement. Now look still further: In chapter 19:1, we read: "Lot sat in the gate of Sodom." In those eastern cities the men who sat in the gate were the chief judges. If you were to translate this into the lan­guage of the present day, you would say Lot is mayor of Sodom. He sits in the gate, the administrator of justice in all small and petty quarrels; a representative of the city to entertain visitors who come to it and to ask them to share the hospitality of the city. That is where he is in this 19th chapter. It is no fanci­ful interpretation. The phrase "sat in the gate" marks the position of the judge and the civil governor. What a wonderful case this is! How wonderfully he has got on! He was quite right that day, was he not, when he made his choice? Try him by some tests of the world and of business today. Was he not a keen, shrewd man? Look at Abraham! He has not got out of his tent yet; he has pitched his tent and altar up and down those valleys and that is all he has amounted to! But this man Lot, how wise a thing he has done! After a while he moves into the city to be nearer the heart of the business, the trade, the com­merce, and the wealth. Men say what a keen, shrewd, wonderful man of business he is, and so at last they make him the mayor of the city, and he is sitting in the gate. Is not that wonderful? First, what has his choice done for himself? Secondly, what has his choice done for his family? Thirdly, what has his choice done for Sodom? Lastly, what is the end he was seeking, and how much has he really made out of the transaction in worldly wealth? 1. What has he done for himself? You do not get to know all by reading this Old Testament story. So beautifully is the Old linked to the New, so incomplete is the Old without the New, and the New without the Old, that you must always take them together. In the New Testament a great ray of light shines back upon Sodom and the man who sits in the gate, and we learn that he vexed his righteous soul day by day. Is that a condition to live in—his house in the city, his wealth in the city, his place in the gate, and possessed of authority among the men of Sodom, but no peace, no satisfaction? What is the inner story? He was a good man in many senses. He believed in God and would like to see Sodom go right and be right; but he took the wrong way to accomplish a right work, and the result is that all through the years of his successes, when men are saying how well he was getting on, in his heart of hearts he never had half an hour's peace. He vexed his righteous soul, and all success to him was but wormwood and gall. I do not think he made much out of it. Abraham pitched his tent yonder, and lit his altar fire, and worshiped God, a sojourner and stranger; but he got a good deal more peace than Lot. 2. Now consider his life as tested by his children. And I do not know any place to test a man more than that. You know the story, the awful story, of corruption, and sin, and wrong that came out of that life. One evening two angels came and warned Lot of the doom coming upon Sodom. "And the men said unto Lot, Hast thou here any besides? Son in law, and thy sons, and thy daughters, and whatsoever thou hast in the city, bring them out of this place: for we will destroy this place, because the cry of them is waxen great before the face of the Lord; and the Lord hath sent us to destroy it. And Lot went out, and spake unto his sons in law, which married his daughters, and said, get up, get you out of this place; for the Lord will destroy this city. But he seemed as one that mocked unto his sons in law." That shows the influence he had over his family. Next morning when he fled the city, only his wife and his two daughters accompanied him. 3. What about Sodom itself? How far has Lot been able to influence Sodom? Not to the making of five righteous men in that city! Mark that. A man who has lived there long enough to rise to be mayor of the city, and yet has not influ­ence enough to make five righteous persons in that city! In spite of that he has vexed his right­eous soul about the iniquity of the place, he has not been able to stem the iniquity to the extent of five per­sons, though he has been there all these years. I will tell you why. The men of Sodom knew per­fectly well he came to Sodom first, not to bless them, but to get wealth for himself. And when a man starts out to enrich himself first, he paralyzes his power to influence any one for God. A man says, "I am going to take up this business and engage in it in this neigh­borhood with all its disadvantages religiously, but I may be able to influence people." If they know you start out, not to influence them, but to enrich yourself, that very fact will rob you of all power to influence men. 4. One word about the result. What result did he have in the way he wished it? He wanted to make money, but how much did he make? I do not know. His bank book was burned and everything else he had made was swept away in the devouring fire of God, and when he got out of Sodom he was the poorest man in the district. Yet I believe richer then than he had been ever since he had made that awful choice. These are the lessons I want to impress upon your heart. I want you to see that whenever a man begins to choose for himself along the line of his personal advantage he is pitching his tent toward Sodom, and is in danger. I go deeper into it than that and say the choice was all wrong. He had no business to have chosen thus. Yet men still choose along this line. There are Chris­tian men today in our churches—I do not deny the fact of their Christianity—who are perpetually pitching their tents toward Sodom. Men pitch toward Sodom with regard to their chil­dren over and over again. A father says, "What am I going to make of my boy?" He makes up his mind what business his boy is to have, and then he sets him­self with full purpose to endeavor to find the college or situation where that boy is most likely to receive the best preparation for his business or profession. You say that is right. That is not right! His first business is to put the boy where his character will be kept right and pure. His first business is to see where he can best secure his child's eternal interests, even though he may have to sacrifice something in temporal things. Men are pitching toward Sodom with their children over and over again, and to secure them a competence in earthly things and bring them to places of success in life, they are risking and ruining their eternal welfare. Another way in which a man pitches toward Sodom is this: He lives in one of our large cities. God prospers him in his business. But what is he moving for? His children are growing up. He is looking for the best suburb, and when he makes up his mind, he looks for the best house, and soon tells you he has found what he wants. "But where are you going to worship?" "I never thought of that. I must go and see." In scores of instances men have blighted the spirit­uality of all their family by taking them away from the city house and the old home sanctuary into a neigh­borhood where there is nothing to help them spirit­ually. You are pitching toward Sodom by going to a new house unless you have taken into account what spiritual food you are going to provide for yourself and your children. I have taken these cases at random to show how subtly men may choose watered plains near cities because of selfish advantage, and run risks stretching beyond the burning of the earth into the eternities that lie beyond. I take this story of Lot, in the second place, as an illustration of the futility of attempting to compromise with God. I say it solemnly and with all earnestness, that if your heart is toward Sodom, you may just as well pitch in Sodom at once, as toward Sodom. You cannot compromise with God. He never made a compromise with a soul yet, and He never will allow you to com­promise with Him. And if, right down at the root of your choice, there is this desire to advantage yourself in matters that are material and earthly, all your religiosity is of no avail. Not only are you ruining your own prospects, but also your power to influence other men Godward. Thirdly, this story is an illustration of success on lines that finally bring most dismal failure. Man can do a very great deal without God. You can pitch your tent toward the city, you can get into the city. Men may flatter you, and you may become mayor without God. But when you have done all, what value is it? What is the worth of every bit of success if you have put God out of your calculation in practical matters? Did that pious and godly man—and he was a good man in some senses, for he could not have lived with Abraham so long without knowing something of the will of God, and the New Testament speaks of him as righteous,—and so the man was wrong, though feeling right, because down in his heart there was simply this desire for selfish aggrandize­ment, and he made his choice upon that and nothing more;--did he gain in the long run? That day when the quarrel came, Abraham did not choose at all. He let the Lord choose. Lot selfishly "lifted up his eyes"—you remember the phrase. How high? As high as the plain. He chose, and when he had done his choosing he went out. After he was gone, God said to Abram, "Lift up now thine eyes." Do you see? Lot lifted up his eyes of his own choos­ing, and when he had made his choice, God said to Abram, "It is your turn now to lift up your eyes." "But, Lord, that is Lot's!" "That is yours, Abraham. Lot can do his own choosing, but he has no title deeds for the land, and the day is coming when it will all revert to the man to whom God has given it." There you have the heart of this incident. Instead of choosing yourself, let God choose. He will say, Lift up thine eyes north, east, south, and west, over the whole land. Blessed are the meek, for they shall inherit the earth. The man who chooses for himself loses all he chooses; the man who lets God choose gets everything, and says, All is mine, because God is mine. Cease your choosing, and let God choose. Amen. What an end to this mess of Lot. HOW MANY RACES ARE ON THIS EARTH? "A certain one of them, Caiaphas, being high priest that year, said unto them, Ye know nothing at all, nor do ye take account that it is expedient for you that one man should die for the people, and that the whole nation perish not." I am not interested for the moment in these extraordinary words Caiaphas uttered, but I pass on to that which comes after: "Now this he said not of himself; but being a high priest that year, he prophesied that Jesus"—this is John's exposition of it, John's inspired statement—"that Jesus should die for the nation; and not for the nation only, but that he might also gather together gather into one the children of God that are scattered abroad." John 11:49. That doesn't simply mean the one nation. It is most explicitly stated, "not the nation only," but "the chil­dren of God that are scattered abroad." There is the clear statement that Jesus Christ came into the world to gather into one the scattered family of the Most High. Trench tells us that it comes to us from the Communists. "The solidarity of humanity." What do they mean when they talk about the solidarity of humanity? It means that humanity is not a gather­ing together of units, each one separate and alone, but that humanity is one; that all men are dependent upon all other men, and that the race is united from its beginning to its end; that this particular generation of which you and I form a part owes an enormous amount to the generations that have preceded us; that we are helping to make the history of the generations that are coming after us; that what Kingsley sang about the new-born baby is perfectly true; that that child is heir of all the ages. Not only is humanity one when you trace it in its movements through history, but in its relationship today. Every nation of the world is linked to every other nation of the world. There is only one race; the human race. These verses form a setting to the particular part of them that I wish to consider, the sixteenth verse, "Redeeming the time, because the days are evil." I have quoted from the Revised Version, and the marginal thought there gives another reading for this particular part of our paragraph. Instead of "Redeeming the time," the margin has, "Buying up the opportunity." I venture to suggest that that is a clearer translation of the original word; and I intend to take that as conveying the thought in the mind of the apostle, "Buying up the opportunity, because the days are evil." "Buying up." The word translated "redeeming" in our Bible comes from another word which means "the market-place." One very often sees in rural districts the market held upon one certain day of the week somewhere in the center of the town, sometimes under cover, sometimes in the open; and to that common meeting-place come those who have goods to offer for sale and those who desire to purchase, and they transact their business in the hours of the market in that open market-place. It is just from that this word comes. In eastern towns the same habit obtained. The merchantman came to the market-place in the center of the town, bringing his wares with him, there to transact his business; and he watched the market and waited for a favorable opportunity either to buy or sell, and when the opportunity presented itself he acted, he did business, he did that which he desired to do. He bought up his opportunity. Now the apostle tells us, who are the children of God, to buy up the opportunities because the days are evil. You cannot have carefully read the epistles of Paul without having noticed how he never forgets the rela­tion that exists between doctrine and duty; that he perpetually lays down for us great principles of life, unfolds before us the great truths of the Gospel of Jesus Christ. But he never does that in order that men and women may possess the knowledge as theorists merely—he always does it in order that he may lead on to a practical application of the truth he declares. The apostle never forgets that the wonder­ful sanctifying force is the force of truth. Take his epistles and look through them, and you will find invariably that there is a statement of some great doc­trine, and then you come to the point in the epistle where he uses his favorite word "Wherefore," and from that point he begins to apply his doctrine to the details of daily life. This epistle to the Ephesians may best be spoken of as the epistle of vocation. He warns those to whom he writes. He unfolds to them the truth of their voca­tion; he endeavors to set their eyes upon God's ultimate purpose for them, and when he has done so through the first and second and third chapters, you find that the fourth chapter opens thus: "I therefore, the prisoner of the Lord, beseech you to walk worthy of the vocation." The vocation is declared in the opening part of the epistle. The effect that the holding of the truth of that vocation would have upon daily life is declared in the latter part of the epistle. He begins by taking us to the heights of vision; then he brings us to the every-day level of life, and shows us how that vision unfolded before us will affect us as we live as fathers and children and masters and servants. A charge has been made against certain ministers during recent years that their preaching has been "other-worldly." My dear brothers in the ministry, I am not perfectly sure that we have not been too much afraid of that taunt and sneer. The moment the church of Jesus Christ ceases to be "other-worldly," she loses her power to affect this world. It is only in proportion as we have a true view of the heavenly calling that we are able to touch the earth upon which we live, as men and women of power. It is only as we realize that everything that transpires to us in the little while between our conversion and the coming of Jesus Christ, all the service rendered and all the lessons learned, are to prepare us for the higher service that lies beyond, that we shall ever be able to render service at its fullest and best upon this earth. I dwell upon that in opening because it lends force to the immediate duty as laid down in this verse: "Buying up the opportunity, because the days are evil." This first thought must be the very background of all our study. Paul, in these opening chapters, has written down the great truth that the church of Jesus Christ will only reach its full sphere of service when it has passed clean away from this life, when it has left behind it the temptation and the sin and all the various experiences of these passing years. Not today can we render our full service, but in God's great tomorrow, when (as Paul shows in this epistle) we, the church of Christ, the Biblical church, the church universal, the church redeemed out of the earth, gathered into eternal union with Christ in the heavens—that church has become the minister of the grace of God to the ages that are yet unborn; a medium through which God shall unfold in perfect clearness to principalities and powers in the heavenly places, His own wisdom and His own power. We are a heavenly people sojourning upon the earth; but, brother or sister, if that be true, through us the light of the heavenly is to fall upon the earthly. The powers of the world to come are to touch the present age through the men and women who are sons and daughters of the world to come, and who will only find the fulfillment of their highest vocation when that eternal day breaks beyond the mists and beyond the shadows. Now with that thought in mind, remembering that we are a heavenly people called to vocation in the heavens, how are we to act upon the earth? Well, all the second half of the epistle unfolds it. I choose to take from it this one word, expressing our immediate duty and privilege : "Look therefore carefully how ye walk"—you remember it is the same thing: "I beseech you to walk worthy of your vocation"—"Look therefore carefully how ye walk, not as unwise, but as wise, buying up the opportunity, because the days are evil." Notice, first of all, the reason that Paul gives why Christian men and women should buy up the opportunity "Because the days are evil." Now if it were possible for us to find out way into Ephesus as it then was, taking that as an example; and if we told the leading men of the city that they had fallen in their lives upon evil days, they would angrily have resented the charge. They would have said: "There never was such a time for Ephesus as this. We were never as prosperous as we are today. We were never as wealthy as we are today. Progress has marked the past, and today we are rich and wealthy." At that time there was a very peculiar combination in Ephesus. Commerce and religion had been united, —that is, of course, the religion of Ephesus. The great temple of their worship was also the banking house of the merchants, and as the merchants poured their wealth into the temple for safe custody, that became an act of worship. Men were perfectly satisfied with themselves in Ephesus, and thought it was a day of prosperity and a day over which they might rejoice; but Paul was writing, not to the citizens of Ephesus, not to the rank and file of the people who dwelt there, but to the church of Jesus Christ, to the children of God, to the men and women of heavenly vocation; and, writing to them, he says: "The days are evil days." So they were and are. They were evil to the men and women who had turned their backs towards idols to serve the living God. The prosperity of Ephesus was the adversity of the church. That in which the men of Ephesus made their boast was what rendered the days evil days to the called-out, separated, sanctified men and women whom God was preparing for the high vocation that lay beyond in the heavens. The apostle says to these people, "You are to redeem the time; you are to buy up the opportunities." This great message comes to us. Our calling is a heavenly calling. The life of Christ bestowed in conversion and coming in all its fullness in the moment when we surrendered to Him, subduing us unto Himself is preparing us for the high calling that lies beyond. For the present moment the word to us is that we are able to buy up the opportunities, and just as surely as the apostle said to these people of Ephesus the days are evil, so he says to us the days are evil. Now in what sense are the days in which we live said to be evil days? Because you know that the world is perfectly satisfied. We are constantly being told there never was such an age as this, an age of progress, an age of advancement, an age of enlightenment There is a danger of some men dying of pride before the century ends, because it has been such a wonderful century. Our cities have marks of progress on every hand. Our commerce is more wonderful than it ever was, and throughout the land you hear the voices of men and women telling you that these are the best days, days full of hope, characterized by progress, days in which the race may be perfectly proud of themselves; and yet in these days the message comes to us, "Evil days!" Now analyze the thought for a moment or two. The majority of the men with whom you come into contact in ordinary business life are not godly, but ungodly. You are bound to mix with them, as matters stand in our cities and in our daily life today. Please do not misunderstand me. I do not say that these men are all disreputable or profligate or fallen. Never forget that a vast amount of the ungodliness of this age, as of every other, is cultured and refined; but it is none the less ungodliness. You can have an ungodliness which is educated and cultured and refined and accomplished but it is ungodliness—and I say the majority of the people with whom you come in daily contact are ungodly people. The days are evil days, then, in that sense, for the development of Christian character. Take the activities of your own life for a single moment in this age when we have got away from simplicity, when we are living a complex life all around. Did you ever try to see how little you could live on for one single week in your life? Did you ever discover how you are almost compelled by the very character of the age in which you live, to give hours' thought and attention every day to an enormous number of things which you could very well do without, material things all of them, with no touch of spirit in them? What shall we eat? What shall we drink? Wherewithal shall we be clothed? These are the questions that we are bound to face today in a measure in which our forefathers did not have to face them. The higher realization of the purpose that we have as we go forth day by day perishes as we touch it. You know that isn't helpful to spirituality. These are evil days. Then we are told that this is the age of progress. It is the age of rush, of movement, of effort. The old sacred art of meditation and contemplation is almost dead. It is the age when men and women are trying to live by the excitements of certain kinds of religious services even within the church, and the old solemn hours of quiet loneliness with God that made the saints of the past, where are they today? We are carried up and forward, before we know it, upon the rush that characterizes the closing years of this century. Oh, when men and women come to me, as they do sometimes, and tell me, "What we need in the church is just to catch the spirit of the age and keep level with it," I say: "In God's name, no! What we need is to be born of the Spirit of God, and that will send us against the spirit of the age and never bear us along with it." Church formats are labeled as traditional and contemporary today. All the rush and restlessness of the age that have crept into the church of Jesus Christ mark these days as evil days and the very atmosphere by which we are surrounded is against the government of God. Do not let us deceive ourselves. Do not let us have meetings and sing our praises about what we have done and where we have reached to. I tell you that if Jesus of Nazareth came back to America, London, Germany and preached the Gospel He preached in Jerusalem, they would crucify Him quicker than they did in Jerusalem. If He came again with the same words, the same teaching, the same actual statements of divine will and government, He would find no room for Himself in the very cities that bear the name of Christian today. The very atmosphere in which we live and move and have our being is an atmosphere against the government of God; and the most terrible thing is this, that while men are against the government of God, they are praying, "Thy kingdom come; Thy will be done." The most terrible blasphemy of the age is not the blasphemy of the slums, but the blasphemy of the temple and the church and the place of worship, where men pray these prayers and then go out to deny every principle of divine government in their lives. And Christian men and women are living in the midst of all this, and the message that came to men at the church at Ephesus is the message that comes to us, "Buy up the opportunities, because the days are evil." Now do you see what the apostle says? He says that the fact that these are evil days is a fact which is to urge you to new watchfulness, to new carefulness, to new zeal. You are to translate all these contrary facts into opportunities for prosecuting the commerce of God. God calls you, God calls me, God calls every child of His to be His representative in the world, taking hold of the things that are against the development of spiritual character and turning them into opportunities for prosecuting His work upon the earth. And when we have said all we have said concerning the days, we have simply laid down the foundation upon which we may build for God. We have simply stated the opportunities which throng upon every side for doing His business and buying up the opportunities for Him. Take any of those I have spoken of. Do I say that the majority of the men that you are surrounded by every day are ungodly men? Every ungodly man that you do business with is an opportunity that you may buy up for God, if you will; an opportunity for the display of your godliness upon his ungodliness. But you ask: "How are we to do it? We have no time to be talking to these people about religion." I won't say anything about that. I personally believe that the gift of personal dealing with men and women is a great gift earnestly to be coveted; but apart from the actual definite saying of words, for which I am not pleading for the moment, if you are a real godly man, your godliness will tell upon ungodliness without ever speaking a single word. I am not saying that business men should always put tracts into their letters; I do not know that it would be wise. I am asking that the business man should remember: "I belong to the heavens, and when I touch the earth I must touch it with the equity of the heavens. When I sell goods I must bring into my transaction the righteousness of the heavens. If I sell a certain measure over the counter, I must remember that the God of the heavens to whom I go for higher service hates an iniquitous measure, and an unjust scale, and in every piece of transaction which I do in my business I am to bring into it the principles that make the foundation of the heaven of God. I must bring into all those transactions the principles of righteousness upon which God is building His city and accomplishing His work. I am to make a name for Jesus Christ in my business. I am so to transact my business amid ungodly men that they shall say, 'You can trust that man because he is a Christian.' "
There will be a great revolution before that day comes. People do not say that now! And we, because we have labeled men Christians that are not Christians, because we have said these men are God's own children and they are not His children, because we have a false label on the nation and a false label on men and a false label everywhere, what we need is that the true children of God, the members of the church with the light of the heavenly calling upon them, should take hold of ungodly men and should look upon them as an opportunity for influencing them by the godliness of their own lives. So with the activities of life. Jesus Christ was no ascetic: No Christian man has any right to attempt to create saintliness of character by hiding himself from the activities of everyday life. No. I must live in my home, but that home must have upon it the stamp of the heavens. I must mix among my friends, but my contact with my friends is to be that which will draw them towards God. When people come into your home they should see in every room, and be able to recognize that Christians live in this home, and should not think: "Yes, it is very nice; but nobody will know walking through here whether you belong to God or the devil." Walk through and looked at your rooms make up your minds that there should be no room in your house from this day on that had not some message for every comer which should tell them that we, at any rate, would serve the King. It is our privilege to take the home in which we, live, all the recreations which we have, and turn them into opportunities for manifesting godliness. We should take all those things and let the light of the heavenly fall upon them; we should go through life showing how all the things of the earth may shine in new beauty as the glory of the heaven falls upon them. Everything in life is to be an opportunity for prosecuting the commerce of God. The unrest of the present age is a glorious opportunity for manifesting the quietness and the calmness in the secret place of the Most High. Oh, for quiet men and women, men and women that know how to be at peace in the midst of the strife! We know a few. That man who, whenever he walks into the committee or church meeting, brings heaven's calm as he comes. His words are few, but his presence speaks. As he comes you feel that you are coming into contact with one who amid the rush and the bustle and the hurry of a godless age dwells in the secret place of the Most High and abides under the shadow of the Almighty. A blessed thing to have men and women who have learned the secret of quietness, and so buy up the rush of the age and turn it into account for a manifestation of the peace and the quietness of God! But if I am to take all life in this way, if I am to seize these opportunities as they go and come, and turn them into account for God, there are certain facts that I must keep in mind: the responsibility that lies upon me that I see the opportunity in the first place, and seeing the opportunity, that I should be willing to make some sacrifice in order to possess it; and that if I am to see an opportunity and make a sacrifice in order to possess it, I must maintain perpetually a right attitude before God, living forevermore in the power of the heavenly calling, and allowing Him to have His way with me and do His own work through me. Now there are just three laws manifested in the verses that I quoted, upon which we may prosecute this commerce of the heavens. Let me very briefly point them out to you. The first is in the fifteenth verse. Men and women who are going to do God's work, "Look therefore carefully how ye walk." "Walk circumspectly;" the old version has it. Look carefully how ye walk. My dear brother, my dear sister, you cannot do God's work in the world, buying up opportunities for Him, transacting His commerce, if you are careless and indifferent about it. Look therefore carefully how ye walk. I know men and women who are very careful when they are at home and awfully careless when they get away from home. I know other men and women who seem to imagine that they can live the Christian life and do God's work without carefulness in the small details of everyday life. If I am to translate my life into service for God, not merely in the deeds done in connection with the church, but in all hours, I shall only do it as I live carefully day by day. You have sometimes seen the top of a wall covered with mortar, and in the mortar pieces of glass or barbed wire are stuck all the way along, so as to prevent boys from climbing and going along. Now I have before now seen a cat walk along the top of that wall; and it walks "circumspectly." How it picks its way! With what carefulness it puts down the foot every time. It gets along by walking very carefully and looking for each place where the foot is to be put among those pieces of glass or a dangerously sharp barb. You and I have to walk, my brother, like that, if we are going to do anything for God in the world. You can't go through a single day carelessly and let things go as they will. Every step must be watched. Every moment must be held as sacred for God, and we are ever to live in the power of the thought that we may miss an opportunity. We must take every moment as an opportunity that needs watching and buying up carefully. We must walk circumspectly. Then the second law of this commerce of God is to be found in the seventeenth verse: "Wherefore be ye not foolish, but understand what the will of the Lord is." That is to say, if I am to do this business of God as a Christian man, I am not only to be careful about it, but I must have keenness, shrewdness. I must know the will of God. I must form the habit of discovering the will of God. You remember that wonderful word about the Messiah uttered by Isaiah long before He came: "He shall be quick of understanding in the fear of the Lord." One Bible student says that that might be rendered, "He shall be keen of scent in the fear of the Lord"—discovering the will of God quickly by a kind of intuition. You only discover the will of God as you obey it the moment you do discover it. It is in proportion as I walk carefully, obeying the will as it is unfolded, that I become quick to discover the will. We are not to foresee; we are to understand the will of God. We are to be a people shrewd, keen, having in our Christian life—having in our prosecution of this work of God—a spiritual acumen which is as necessary as business acumen to the man that is going to make his fortune in business. And then there is another thing. I must not only be careful, shrewd and keen, understanding the will of the Lord; but I must have capital, or I never can do God's work in the world. I cannot be a businessman for heaven unless I have heaven's capital, and here it is in the eighteenth verse: "Be not drunk with wine, but be filled with the Spirit." When a man is filled with the Spirit, he has the capital of God to do the work of God. Then all that I have spoken of will become easy and natural. It will become—I was going to say second nature; I will say something better—it will become first nature. It will be perfectly natural to influence men toward God. This great subject of influence, we have heard about it since we have been children, but we have hardly begun to understand or tell it. We have never seemed yet to grasp this truth that the influence a man exerts is the influence of what he actually is in himself. You talk about keeping up appearances. You talk about living straight before men. You say, "Well, I wouldn't like to do this, that and the other before men because I must keep up an appearance or I will lead them wrong." It doesn't matter. Do what you are; because whether you do or not, you will influence men by what you are. Influence is altogether too subtle to be changed by any outward activities. If a man is filled with the Spirit of God, he is spiritual, and his influence will be spiritual. It is an absolute impossibility for two men born again of the Spirit, filled with the Spirit, to work side by side for years, and neither one or the other' find it out. If one man is a Christian and the other isn't, the man that isn't will soon see the difference in the work the Christian man does. Christian men do pure, strong work, and the best work in the world. "But," you say, "I have had men working for me who don't do the best; and he is a Christian." No, he isn't! If a man is filled with the Spirit of God it will bring all the facts of the divine will into every action of his life; and if you get this capital behind you, it won't be hard work to influence men for Christ; it will be the necessity of your life. The passion of your soul will be to win another soul for Christ, to weave another garland wherewith to deck His brow, to plant another gem in His diadem; and your life will be doing it as well as your words. You must have the capital of God to prosecute the commerce of God. And what about amusements: "Ought we to do this, that and the other?" Well, you must only take up amusements in which it is possible for the Holy Spirit to reveal Jesus Christ. You say: "That is very narrow." No, it isn't; it is very broad. That for me settles a great many questions of amusements. I know young people who make golf an instrument of the devil. If a man gives himself wholly up to it, so as to neglect other things and make other people uncomfortable in the world, that isn't Christianity. But that and other kindred kinds of amusement can be had as pure recreation and so played that the very gentleness and beauty of Jesus Christ shall be manifested in the playing. Every activity of life which is in itself right and pure will shine with glory the moment you become a spirit-filled soul; and instead of being narrow and shut up within confined walls, you will be able to see that He has set your feet in a large room, He has unlocked for you all the avenues of life. Filled with the Spirit, you will be able to manifest the beauty and the glory of the will of God as against all the rebellion of the age in which we live. And now I want to press a question on you that you will answer to yourself: How much are you worth? What are you worth? I don't ask to know anything about your balance at the bank. What are you worth? What do you possess? You say: "I own so much. I own my home." No, no, you don't! What do you possess? You only possess the things you have bought for the kingdom of God. You are rich as the number of the hours which you have bought up. The time redeemed is wealth. Every time you buy up an opportunity for Him, every time your life tells upon an ungodly man, every time your dealings with God shine out in some of the activities of your life, every time by sacrifice you influence a soul towards God, in that moment buying up an opportunity, you invest an hour in God, and with those hours God is making your fortune. You are not worth the things you possess upon the earth. They fade and vanish. They are of the earth, earthy. You are only worth the treasure that you have laid at His gates, the influence which you have purchased by sacrifice for Him. These are the things which mark your value and your work, and make your fortune. See, that was the result, and He will show how you helped that day to bring in righteousness, and to move with God towards the consummation of the purpose of His heart of love. That is how men are making fortunes. Aren't you going in for this sort of business? Aren't you going to take life anew from this time and say, "I am going to make this life a place in which I prosecute heaven's commerce. I will take the opportunities as they come, and buy them up for God. I will take my home; it is an opportunity which I will purchase for the exhibition of all the beauties of the Christ like character and all the purposes of the divine heart. Life to me henceforth shall be an opportunity for doing God's business and laying up treasure in heaven." Is that your determination? Then you must go to the King and say, "O King, I want to be Thy merchantman on earth. Give me the capital I need. Give me the filling of Thy Holy Spirit. Then shall all my service be a delight, and I shall be able to take all hours and all activities and everything that comes to me and transmute it from the dross of earth into the gold of heaven." May God help us every one to be His businessman! Ever been thrown out of the nest? Have you ever seen an eagle stir up her nest? Do you know what happens? There in the nest, right upon the rocky height, are the eaglets; the mother eagle comes, and, taking hold of the chicks, she flings them out of their nest. They were so comfort­able there, but she flings them right out of the nest high above the earth. They begin to fall straight to the ground. They have never been in air before; they have always been in the nest. Is not that mother bird cruel? Why does she disturb the eaglets? As you watch her, you will understand. As long as you look upon the struggling eaglets in the air you miss the point. 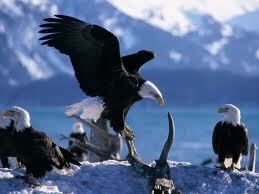 Watch the eagle. Having stirred up her nest, "she spreadeth abroad her pinions," the pinions that beat the air behind her as she rises superior to it. Where are the eaglets? Struggling, falling; she is superior; they are falling. Then what does she do? "She beareth them on her pinions." She swoops beneath them, catches them on her wings, and bears them up. What is she doing? Teaching them to fly. She drops them again, and again they struggle in the air, but this time not so helplessly. They are finding out what she means. She spreads her pinions to show them how to fly, and as they fall again, she catches them again. That is how God deals with you and with me. Has He been stirring up your nest? Has He flung you out until you felt lost in an element that is new and strange? Look at Him. He is not lost in that element. He spreads out the wings of His omnipotence to teach us how to soar. What then? He comes beneath us and catches us on His wings. We thought when He flung us out of the nest it was unkind. No; He was teaching us to fly that we might enter into the spirit of the promise, "They shall mount up with wings, as eagles." He would teach us how to use the gifts which He has bestowed on us, and which we can­not use as long as we are in the nest. Fancy keeping eaglets in the nest! It is contrary to their nature, contrary to the purposes for which they are framed and fitted. There is a purpose in the eagle. What is it? Flight sunward. There is a pur­pose in your life, newborn child of God. What is it? Flight Godward, sunward, heavenward. If you stop in the nest, you will never get there. God comes into your life and disturbs you, breaks up your plans, and extinguishes your hopes, the lights that have lured you on. He spoils everything; what for? That He may get you on His wings and teach you the secret forces of your own life, and lead you to higher development and higher purposes. This article takes us into that class of attributes known as the goodness of God. As can be very readily seen this deals with the moral nature of God. In this respect it is possible to note a twofold division of attributes. On the one hand God possesses attributes which describe what He is in Himself. These are three in number, that is, God is holy, true and love. While on the other hand, God possesses attributes which describe what He is in relation to others; that is because God is holy in Himself, He is righteous in relation to others; because He is true in Himself, He is faithful in relation to others; because God is love in Himself, He is merciful in His relation to others. It is impossible to treat all of these attributes adequately in one article, so I have selected the first of the six for this article. While in many respects it is impossible to evaluate the six in terms of one another, there is a sense in which the first of the six is the most important. It is the one attribute which gives value to all the others and without which the others could not exist. This is the one attribute without which God could not be God, and which in the fullest sense differentiates the true God from all other gods. It is there­fore not surprising that this attribute has been the object of attach from Satan from the very beginning. The seeds of doubt were planted in the garden and four millenniums later Satan tried to barter the pure soul of Christ for this paltry world. In the end time Satan will make one final effort to establish a man of sin in the place of the sinless Son of God. Of all the attributes of God, this one is the least in the concern of mankind, saved and unsaved people alike. It is the one attribute which man is most ready to forget, to distort, or to deny. It is the one attribute in the nature of God which makes salvation necessary, and the one attribute which God bestows in moral fullness when He saves men. It is the one quality without which no man shall see God, nor have the privilege to enjoy the courts of heaven. So vital in importance is this attribute to a true understanding of God that this one article should be carefully considered by every reader. It is not only the key to the nature of God, but it is the doorway to the dealings of God in His methods and movements among men. I. THE HOLINESS OF GOD APPLIES FIRST OF ALL TO HIS DIVINE MAJESTY. It will be discovered that the Hebrew and Greek terms for holiness bear the sense of separateness. One use of the word will confirm this. In Gen. 38:21 it is recorded, "Then he asked the men of that place, saying, where is the harlot, that was openly by the way side? And they said, there was no harlot in this place". The word for harlot is the word elsewhere translated "holy". It thus can be seen that a harlot was one who stood in a separate relation to all society. Such then is the meaning of the word. When the word was first used of God it had first to do with his separateness from the standpoint of His greatness. In this sense He was high, mighty, above the entire universe which He created. The Psalmist had this in mind when he wrote these words of Psalm 99, "The Lord reigeth; let the people tremble: He sitteth between the cherubim: let the earth be moved. The Lord is great in Zion; and He is high above all the people. Let them praise Thy great and terrible name; for it is Holy.” (Psa. 99:1-3). Isaiah also wrote similar words in the course of his prophecy. In the midst of words of sore denunciation upon the people of Israel for their sins, there come these words of encouragement. “For thus saith the high and lofty One that inhabits eternity, whose name is Holy; I dwell in the high and holy place, with him also that is of a contrite and humble spirit, to revive the spirit of the humble, and to revive the heart of the contrite ones.” (Isa. 57:15). But perhaps the classic passage intended to convey to the mind of the reader the high dignity and majesty of God is recorded in Isaiah 6. It comes at a time in Israel when Isaiah the prophet is most inclined to depression for the greatest person in his experience has been claimed by that king of terrors, death. Uzziah had been king for 55 years. His reign was marked by prosperity and prestige and power. And Isaiah, closely associated with the royal household, had been impressed and awed by this king. Then one day, that long, glorious reign came to an end. For the moment, the sun went down below the horizon of this young prophet, and darkness spread abroad with all its fears. In the midst of this depression, a vision came to Isaiah in the temple. Note the description of what he saw as we consider that next. (Isa. 6:1-3). II. EVENTUALLY HOLINESS CAME TO REFER TO THE MORAL PURITY OF GOD. There is not a great step from majestic greatness to moral purity. If God is above his creation in greatness, then reason requires that God also be good. Therefore the word holy came to refer to God’s moral purity. And in this sense, the word holy is used almost exclusively throughout the Bible. After ascribing praise to the majestic greatness of God in the first three verses of Psalm 99, the Psalmist passes over to the fact of moral purity in the remainder of the Psalm (4-9). In an earlier Psalm he asks the question, “Who shall ascend into the hill of the Lord? Or who shall stand in his holy place? He that hath clean hands, and a pure heart; who hath not lifted up his soul unto vanity, nor sworn deceitfully" (Psa. 24:3-4). It appears then that holiness is the fundamental moral attribute of God, and the thing that makes him God. As Isaiah views the vision in the temple, with Jehovah high and lifted up, and his train filling the temple, he sees some of the spirit creatures that have been in the presence of God from the beginning. The seraphim indicate their modesty in the presence of God by covering themselves with their wings. 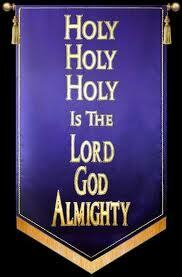 And when they cry out it is - "Holy, Holy, Holy is Jehovah of hosts: the whole earth is full of his glory" (3). This ministering choir does not cry out "Love, love, love is Jehovah of hosts". God is not holy because He loves; but He loves because He is holy. The basic nature of the kingdom of God is holiness. That is the meaning of the Psalmist, “For God is the king of all the earth...God reigneth over the heathen; God sitteth upon the throne of his holiness" (Psa. 47:7-6). The King Who sits on the throne someday shall wield a scepter of righteousness; He is anointed to this place because He loves righteousness, and hates iniquity (Heb. 1:8-9). During His reign "They shall not hurt nor destroy in all My holy mountain: for the earth shall be full of the knowledge of the Lord, as the waters cover the sea" (Isa. 11:9). III. THE PRACTTCAL VALUES FROM THE FACT OF GOD’S HOLINESS ARE MANY. Perhaps the first experience of the sinner who gets a vision of God's holiness is a revelation of his own sinfulness. That was Isaiah's experience, and it has been the experience of every soul of who ever came to the Lord. Isaiah cried out "Woe is me, for I am undone; because I am a man of unclean lips, and I dwell in the midst of a people of unclean lips: for mine eyes have seen the King, the Lord of hosts" (5). It was Socrates who said "Know thyself”. And as wonderful as that may be, no man ever knew himself until he first caught a vision of a holy God. It is also evident from the Scripture that God's holiness is definitely responsible for the salvation of the believer. In every respect it corresponds to holiness. Again the Psalmist said, "Oh sing unto Jehovah a new song; for he hath done marvelous things: his right hand, and his holy arm, hath wrought salvation for him" (98:1 RV). That event at Calvary where sin was done away forever was followed by the resurrection where Christ was declared to be “the Son of God with power, according to the spirit of holiness, by the resurrection from the dead" (Rom. 1:4). Once the believer has entered into the camp of the saints, he then learns that an obligation for holiness rests upon him, in fact, he is called saint, or holy one. This is by no means true of his state. But it is true of his standing. And he is therefore obligated to bring his state up to his standing. But there comes the call of the Lord which is basic, "But as He which hath called you is holy, so be ye holy in all manner of conversation; because it is written, Be ye holy, for I am holy" (1 Pet. 1:15-16). And the command is not mere idle talk, for without holiness "no man shall see the Lord" (Heb. 12:14; 1 Pet. 1:17). The practical value of the holiness of God is further enhanced by the encouragement to humility and contrition. Though we have cited the passage before from Isaiah, it is in order again. "For thus saith the high and lofty One that inhabiteth eternity, whose name is Holy; I dwell in the high and holy place, with him also that is of a contrite and humble spirit, to revive the spirit of the humble, and to revive the heart of the contrite ones" (Isa. 57:17). That a stimulus to virtues that are so wanting. Christ's high priestly prayer, “And now I am no more in the world, but these are in the world, and I come to Thee. Holy Father, keep them through Thine own name those whom Thou hast given Me, that they may be one, as We are" (John 17:11). As a warning to saints and sinners alike, let all remember that holiness provides the awful background for divine judgment. Believers must come before the Bema Seat someday, but Paul reminds them that "knowing therefore the terror of the Lord" (2 Cor. 5:11), he persuades men. Someday all the wicked shall come before a great white throne. Its awful whiteness unrelieved by any colors whatsoever, symbolical of the holiness of God, causes even the earth and the heaven to flee away (Rev. 20:11 ff). This alone ought to act as a solemn warning to men to flee from the wrath to come. IV. THE HOLINESS OF GOD PROVIDES THE PPOVIDES THE PROPER BACKGROUND FOR THE CALL TO PERSONAL SERVICE. It is highly questionable whether anything short of the absolute holiness of God provides sufficient background for an effective call to ministry. It was out of a background of the majesty and moral purity of God that caused Job to abhor himself and repent in dust and ashes. Then there came his commissioning for priestly ministry in behalf of those miserable comforters (Job 42:8). Daniel's vision of the Lord's holiness left him sick and without strength. But it was here that Daniel wrote the vision and sealed the words of the book until the time of the end for the generations yet unborn (Dan. 12:4,9, 13). It was on a similar background of holiness that John fell at the feet of the Lord as dead. And then when touched by His gracious hand, he was then commissioned to write the things he had heard and seen (Rev. 1:17-19). It was Peter who beheld the majesty of Christ when the miraculous draft of fishes came from the sea. His first response was to get away from the Lord. "Depart from me, Lord, for I am a sinful man". But his sinfulness and the sinfulness of people only put him in a position to be used of the Lord. It was then that the call came. “And Jesus said unto Simon, fear not; from henceforth thou shalt catch men. And when they had brought their ships to land; they forsook all, and followed him." Luke 5:10-11). WILL WE REALLY END UP PERFECT? IS THE OT TOO BLOODY?